This the communication cable which can used for the GPS units found on Build Your Own Drone and is 100 centimeters long, it connects the GPS unit to the ArduPilot Mega boards. It will mate with the EM406, EM401, MTK and uBlox Adapter units. 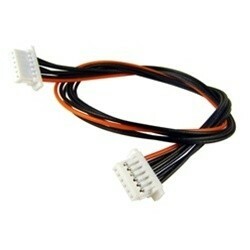 The cable has two a 6-pin JST connectors with 1mm pitch and is wired pin 1 to pin 1.